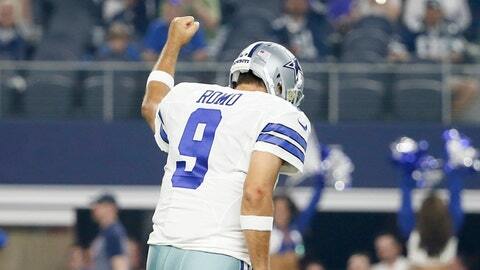 Dallas Cowboys quarterback Tony Romo (9) celebrates his touchdown pass against the Minnesota Vikings during the first half of a preseason NFL football game Saturday, Aug. 29, 2015, in Arlington, Texas. ARLINGTON, Texas — Cowboys quarterback Tony Romo appeared ready for the regular season as he played a quarter and a half against the Minnesota Vikings Saturday night at AT&T Stadium. He ended the night going 5/8 for 88 yards, two touchdowns, and a 139.6 passer rating. "I’ve always felt like you need to play," Romo said. "It’s hard at the quarterback position, I think, because when you’re in there and you go through the situations every week, every day that you’re at training camp what happens is everything just gets sped up just a little bit and then your internal clock wants to move a little faster." Minnesota scored first with a 28-yard Blair Walsh field goal with 1:14 in the first quarter. On the first play of the second quarter, Terrance Williams got the Cowboys on the board early with a 60-yard catch-and-run touchdown from quarterback Tony Romo to help Dallas take a 7-3 lead. "Yeah, he’s great," said Romo. "He’s had a great off-season and a great camp. He continues to get better and better. He’s probably one of the best run-after-the-catch guys I’ve ever seen. So, if he’s got the ball in his hands, he’s got a chance to score." The Vikings special teams earned a free score when returner Cordarrelle Patterson took the kickoff back for a 107-yard touchdown to put Minnesota back on top 10-7. "Disappointing," Cowboys head coach Jason Garrett described it. "Obviously their guy is one of the best in the league, and you can never give up kickoff returns for touchdowns in this league and expect to be successful. So, we’ll get a chance to look at it tomorrow on the tape and see what the issue was. But we simply have to do a better job in that area." Despite the special teams mistake, Romo looked healthy and nimble. He spun out of some Vikings pressure on first-and-goal from the 8-yard line to find rookie Lucky Whitehead for a touchdown to put Dallas up 14-10. "He brings it every day," Romo said of Whitehead. "And I feel like we talk to the rookies, one of the big points that I make to them is figure out how to turn that internal clock on every day you walk into the locker room. It’s hard. It’s not easy to get ready for practice every day and commit to get the playbook and then not get much sleep and then do it again the next day. But you flip that switch when you walk in there, you have that chance. He does that every day. He’s a football player." Walsh added a 45-yard field goal with 1:05 left to cut the Dallas lead to 14-13 heading into halftime. Brandon Carr nabbed a Shaun Hill pass intended for Stefon Diggs for the Cowboys’ first interception of the preseason. Carr had been beaten by Mike Wallace on a 39-yard pass from Teddy Bridgewater earlier in the first quarter. Rookie defensive end Randy Gregory got his third sack of the preseason when he dropped Bridgewater for a one-yard loss. The Cowboys first-team running back committee compiled 53 yards on 11 carries with Darren McFadden rushing four times for 37 yards while Joseph Randle carried the ball six times for 15 yards. Lance Dunbar had a lone carry for a yard.